The Chanclas entered Game 3 facing elimination and hoping to prevent another quick start from the Hooks. Getting the Game 3 assignment for San Antonio was right-hander Jesse Scholtens, who had been one of the most reliable starters for the club in 2018. However, Friday was not the hurler's night. Corpus Christi jumped out to a 1-0 lead in the first with a Taylor Jones two-out, double to center. After the Chanclas tied the score at one on a Forrest Whitley wild pitch, the Hooks quickly went back in front when Randy Cesar led off the second with a homer to left. The score remained the same until the fourth when the Hooks displaced a historic power show. The inning began rather harmlessly for Scholtens, who retired two outs around an Abraham Toro double. However, Lorenzo Quintana continued the frame with a homer to left to give the Hooks a 4-1 lead. After Anibal Sierra followed with a homer of his own, Game 2 star Chas McCormick made it three in a row with a blast over the wall in left. The three straight homers ended the night for Scholtens, who was replaced by fellow righty Lake Bachar. The change in pitchers did not halt the homer barrage as Stephen Wrenn helped Corpus Christi tie a Texas League record when he took Bachar deep to left. The last TL team to accomplish the feat was Galveston vs. Wichita Falls on June 15, 1922. San Antonio got one of the runs back in the bottom of the frame against reliever Brandon Bailey with Austin Allen's productive groundout. Josh Naylor drew the Chanclas within four in the fifth when he sliced a two-run single to left. Fortunately, for the Wolff crowd of 3,926, the excitement of a comeback would go into overdrive in the sixth. Allen began the uprising by working a walk against Bailey and then quickly moved to third when Hudson Potts followed with a double to left. 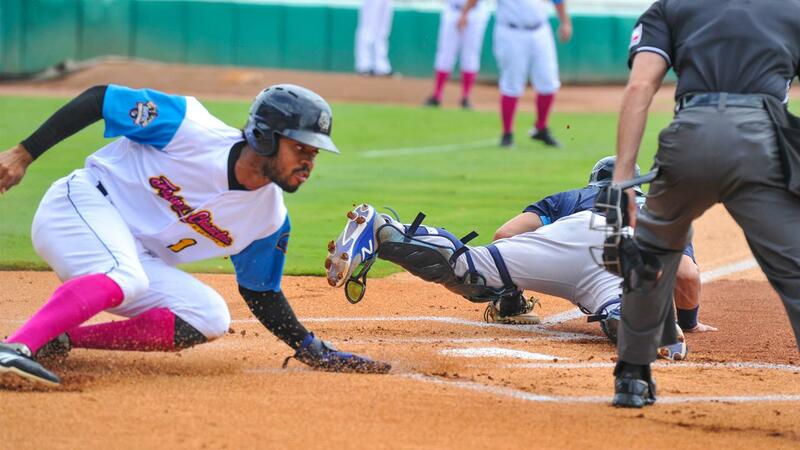 Catcher Webster Rivas made the score 8-5 when he lifted a sacrifice fly to center. The rally continued with Peter Van Gansen, who cut the deficit to two with a sharp single down the right-field line. Bailey's night would end when Buddy Reed made the score 8-7 with a triple into right center. The Hooks called on Alex Winkelman to escape further trouble, but the lefty was unable to preserve the lead as a wild pitch to next batter, Owen Miller, scored Reed with the tying run. The score would remain the same into the bottom of the 11th. Reed began the frame with a walk of reliever Erasmo Pinales (0-1). On the first pitch to next batter, Owen Miller, Reed swiped second to move into scoring position. Then mother nature intervened. Game 3 was halted by a downpour and eventually suspended. The Chanclas returned Saturday afternoon looking to cash in on a golden scoring opportunity. It took them two minutes to do so. Miller returned to the batter's box facing new pitcher Carlos Hiraldo. Miller would move Reed to third when he bounced out to Toro. Corpus Christi, with first base open, elected to pitch to All-Star Josh Naylor. That turned out to be a big mistake as Naylor put the ball in play to Ryne Birk. The second baseman was forced to go home to try to get Reed, but the throw was late and the Chanclas took a Wolff thriller. Nick Margevicius will get the ball for the Chanclas in Game 4. It will be the lefty's first Double-A action. J.B. Bukauskus will make the start for the Hooks.